National Geographic presents a fantastic infographic showing the relationship between cost of health care (on a per capita basis), the rate of usage, and life expectancy. There is little clear relationship between cost, usage, and life expectancy. But there is one fantastically spectacular flyer: the United States. In return for paying nearly $3000 more per capita than their nearest competitor (Switzerland, if you're counting out there), the US gets about 3.75 fewer years of life expectancy while visiting the doctor about the same number of times (less than 4) per year. Compared to your neighbour to the North (and my present country of residence), Canada, you in the US are paying about $3400 more per capita while getting about 2.5 fewer years of life and fewer doctor visits (0-3 compared with 4-7). Compared to a real success story like Japan, the US pays about $4700 more per capita, gets 4.5 fewer years of life, and 0-3 doctor visits instead of 12 or more. 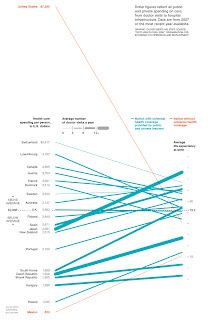 Given that there is only one other country on the graphic without national health care of some kind (Mexico), and that Mexico has a very different relationship between cost, usage, and life expectancy, this infographic does not specifically indict the lack of national health care as the cause of the wild difference between US costs and the rest of the world. It does, however, demonstrate that national health care can and does provide effective health care (better care than the US gets) for less cost. Much less cost.